Click on Products in the menu on the left to display the Products page. Display name The name as you want it to be shown in the Developer portal. Name A descriptive name of the product. Description The Description field allows you to provide detailed information about the product such as its purpose, the APIs it provides access to, and other useful information. State Press Published if you want to publish the product. Before the APIs in a product can be called, the product must be published. By default new products are unpublished, and are visible only to the Administrators group. Requires subscription Check Require subscription if a user is required to subscribe to use the product. Requires approval Check Require approval if you want an administrator to review and accept or reject subscription attempts to this product. If the box is unchecked, subscription attempts are auto-approved. Subscription count limit To limit the count of multiple simultaneous subscriptions, enter the subscription limit. APIs Products are associations of one or more APIs. 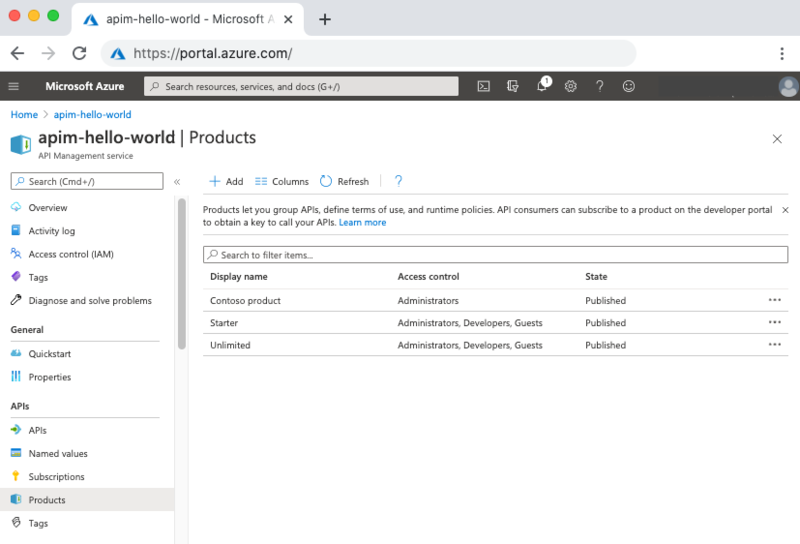 You can include a number of APIs and offer them to developers through the developer portal. You can add an existing API during the product creation. You can add an API to the product later, either from the Products Settings page or while creating an API. Click Create to create the new product. You can continue configuring the product after saving it by choosing the Settings tab. View/add subscribers to the product from the Subscriptions tab. Set visibility of a product for developers or guest from the Access control tab. Products are associations of one or more APIs. You can include a number of APIs and offer them to developers through the developer portal. You can add an existing API during the product creation. You can add an API to the product later, either from the Products Settings page or while creating an API. Developers must first subscribe to a product to get access to the API. When they subscribe, they get a subscription key that is good for any API in that product. If you created the APIM instance, you are an administrator already, so you are subscribed to every product by default. From the Products tab, select a product. Navigate to the APIs tab. Choose an API and click Select. 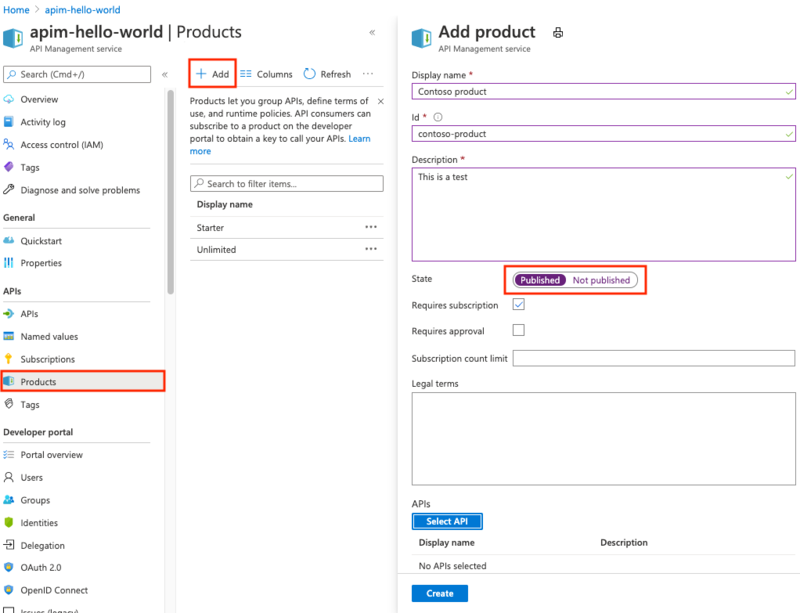 You can create or update user's subscription to a Product with custom subscription keys through REST API or PowerShell command.